1. Use of website. This website provides information and services to our member companies, external stakeholders, and the public. Certain sections of this website are intended for particular audiences such as our member companies and other external shareholders. 2. Content. AmCham Sweden will make reasonable efforts to include accurate and up-to-date information on this website but makes no warranties or representations of any kind as to its accuracy, currency, or completeness. You agree that access to and use of this website and the content thereof is at your own risk. AmCham Sweden disclaims all warranties, express or implied, including warranties, express or implied, including warranties of merchantability or fitness for a particular purpose. Neither AmCham Sweden nor any party involved in creating, producing, or delivering this website shall be held liable for any damages. This applies without limitation to direct, incidental, consequential, indirect or punitive damages, arising out of access to, use of, or inability to access or use this website, or any errors, or omissions in the content thereof. This disclaimer of liability also applies for damages to, or for any viruses that infect, your computer equipment. 5. Accounts, passwords, and security. If any of the services provided on this website requires you to register with your contact details, you must complete the registration process by providing and maintaining current, accurate and complete information as requested on the new member registration form and maintaining the strict confidentiality of your password. You are fully responsible for all activities occurring once you have logged-in. You agree to notify AmCham Sweden immediately of any unauthorized use of your account or password or any other breach of security and ensure that you log-off at the end of each session. AmCham Sweden is not responsible or liable for any loss or damage that may occur as a result of someone else using your password or account, either with or without your knowledge. However, you could be held liable for losses incurred by AmCham Sweden or any other party due to someone else using your account or password. You are not permitted to use anyone else’s account. AmCham Sweden reserves the right to terminate your access to this website should AmCham Sweden in its sole discretion consider your use of this website to be inappropriate. Upon termination of your access to this website, you must destroy all materials obtained from this website which allow identification of any individual. 6. Third-party websites and links. This website may contain links or references to other websites maintained by third-parties over whom AmCham Sweden has no control. Such links are provided merely as a convenience. Concomitantly, this website may be accessed from third-party links over whom AmCham Sweden has no control. AmCham Sweden makes no warranties or representations of any kind as to the accuracy, currency, or completeness of any information on such website and shall have no liability for any damages or injuries of any kind arising from such content. Inclusion of any third-party link does not imply an endorsement or recommendation by AmCham Sweden. 7. Non-confidential information. Any communication or other material that you email to us such as any questions, comments, or suggestions is and will be deemed to be non-confidential. AmCham Sweden shall have no obligation of any kind with respect to such information. AmCham Sweden shall be free to use any ideas, concepts, know-how, or techniques mentioned in such communication. 9. Copyrights. The content of the AmCham Sweden website may not be copied other than for non-commercial individual reference with all copyright or other proprietary notices retained, and thereafter may not be recopied, reproduced, or otherwise redistributed. Apart from this, without the express written consent of AmCham Sweden, you may not otherwise copy, display, download, distribute, modify, reproduce, republish, or retransmit any information, text, or documents from this website either electronically or in hard copy. Moreover, you may not create any derivative work based on such images, text, or documents without the express written consent of AmCham Sweden. 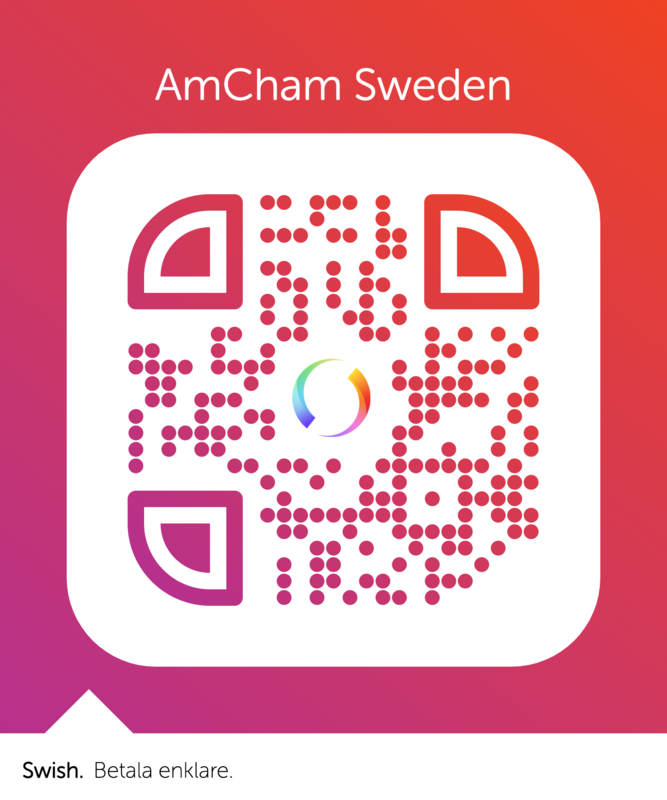 AmCham Sweden member companies may use the AmCham Sweden logo in your company’s advertising, literature, and websites under the condition that you refrain from asserting any ownership, proprietary or other rights in any logo. When used on a website, any hyperlink associated with the AmCham Sweden logo may only point to the AmCham Sweden website. The logo may only be used in the form supplied by AmCham Sweden and may not be used in a modified or defaced form. 10. Void where prohibited. Any information and services provided on this website are void where prohibited. This website and its contents are intended to comply with the laws and regulations of Sweden and relevant European Union regulations and directives. Other countries may have laws and regulatory requirements that differ from those in Sweden and the European Union. This website contains links to other websites, some of which may be outside Sweden and the European Union. Those websites may include information that is appropriate only in that originating country. AmCham Sweden reserves the right to limit provision of its services to any person, geographic region, and/or to limit the services we provide.